Ekornes Stressless Vision Recliner (small size) with Ottoman- Choose Unwind and Save! Enjoy Fast, Worry-free Delivery on a Stressless Vision Recliner with Ottoman. It's a great time of year to purchase from the amazingly comfortable, Stressless Vision line! This popular, modern recliner delivers exquisite head, neck and back support and the over-stuffed smooth, soft, cushioning allows you to sit undeterred for many hours on end. The Stressless Vision recliner is among the most modern Stressless recliners available. It is an excellent time of year to purchase from the well-padded, soft, comfortable Stressless Vision lineup! This super-comfortable series guarantees unsurpassed head, neck and back support and the perfectly soft cushioning allows you to sit undeterred for many hours on end. 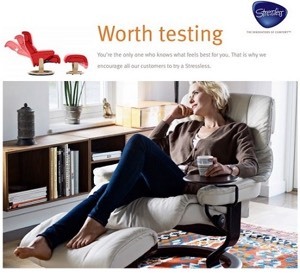 We offer the best prices authorized by Ekornes on all Stressless Recliners and Chairs. You save time and money with our Fast Delivery to anywhere in the continental United States (and other parts of North America). We have 1000's of items in stock for immediate shipping. We also deliver Fully-Assembled, Brand-New items right through the front door of your business or home with the Fastest Shipping Methods available. Our Delivery Options can have Recliners in stock for Immediate-Shipping delivered to virtually anywhere in North America in 1-5 business days. There's no need to pay for standard shipping when you can have Priority Shipping at no cost. All of our items are backed by the rock-solid 10 year Manufacturer's Warranty at no additional cost. You can truly relax and unwind when you choose the world's most advanced recliners. From the patented technologies, to the outstanding construction and engineering, down to the incredibly useful accessories, you will be able to relieve stress and tension and promote a genuine sense of well-being in this seating solution. The Vision Recliner is a popular model because it is thickly padded. The adjusting headrest allows you to position the head and neck support in just right the place. This model, including its larger siblings the Dream and the Spirit, is slightly larger than the average recliner. They also feel wider than average because of the outward slanting armrests. Rather than feel nestled into the chair, you feel cupped in a luxurious, dense foam. Add in the patented Stressless Technologies that we all know and love and you have one seat that is guaranteed to impress. It is certainly a great time of year to purchase from the smooth, soft, luxurious Stressless Vision, Dream (and Dream Office), Spirit lineup! This ultra-comfortable series delivers unsurpassed head, neck and back support and the perfectly soft cushioning allows you to sit undeterred for many hours on end. This line is especially popular among customers that also enjoy the Stressless Paradise sofa and the E300 Sofas with ErgoAdapt™ technology. Your Body will Love the Ekornes Stressless Vision Recliner (Small) with Ottoman. Learn about Inside or White Glove Delivery. *Would you prefer to receive your Vision recliner faster? Choose one of our other speedy delivery methods. 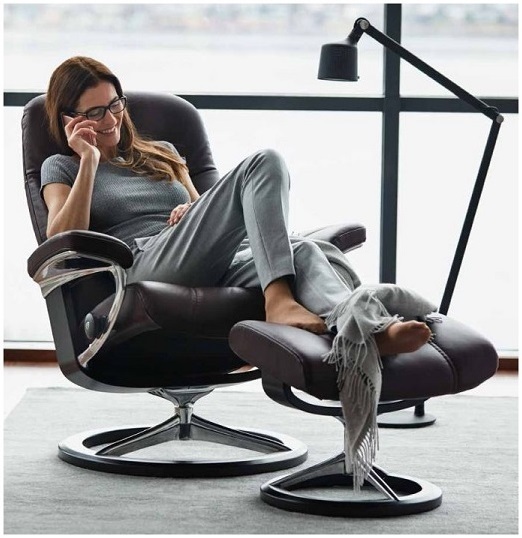 With smooth, elegant curves that flow like water in a bubbly brook, the Stressless Vision Recliner will support your head, neck and lumbar like no other recliner. In fact, you might find it quenches your body's support and comfort needs perfectly. Like its larger brothers (the popular Stressless Dream recliner and the Stressless Spirit recliner), the Stressless Vision recliner is smooth, curvy and extremely comfortable. We find this model to be perfectly suited for those that don't like the cramped confines of the typical recliner. When sitting in the Vision Recliner, customer's get a sense of "openness and roominess." Even with the excellent lumbar and neck support, it truly feels very relaxed and uncramped. The Vision recliner offers the Patented Plus System for constant comfort and is so stylish and elegant that it will feel "at home" in almost any living room, game room, or even at the office. Yet it still manages to deliver the same back and neck-saving features that Ekornes Stressless Recliners, chairs and furniture are famous for throughout the world! The Stressless Vision offers great comfort and support- especially to individuals who fit the "small" to "medium-small" frame size characteristics (the warranty is valid for weights up to 350 pounds). Since we feel that the "company car" might be losing some ground as far as perks go, we'd like to recommend a perk that will continue to deliver for years to come- a Stressless Vision recliner. Could someone please call our supervisor and mention this idea? We're thankful to get to use the company car, but fluctuating gas prices tend to stress us out. - The Patented Plus System which provides continuous support for your head and lower back. - Stressless relaxes your entire body by providing perfect balance and optimum support. - The easily-moved ottoman also features the built-in Tilt System that pivots with your body movements for the ultimate in comfort. The ottoman can also be locked so that it can be used as a handy, separate sitting stool. - Stressless Recliners and Accessories are built to last for many, many years. A round base and double-stem support ensure stability. The European Beechwood is one of the hardest woods we've seen and extremely durable (not to mention stunning to the eye). -Stressless Recliners are created for a custom fit- Many of the Stressless recliners come in three sizes (small, medium or large) and many sofas are available in two sizes (medium or large). The small Vision Recliner is comparable in size to the smaller versions of other Stressless recliner lines (Stressless Chelsea, Stressless Tampa, Stressless Diplomat, etc). Both the Stressless Dream andStressless Spirit Recliners (medium and large) share the same attributes, in both look and feel. For best results, take a seat and let us help you determine which size will ultimately offer the most comfort and correct support for your individual body size and weight. We really want you to benefit from your Stressless Recliner for many years to come! We have many Vision recliners in stock in multiple locations which allows us the ability to ship your recliner extremely fast and have it delivered quickly from coast to coast. Typically, we can deliver your recliner nationwide faster than any other company. The Unwind Company currently offers same-day delivery to almost 70 cities across the United States. Due to the time-sensitivity of our Unwind Express Delivery Service, we are currently unable to process these orders online. Please call 1-888-486-9463 and you can be enjoying your Stressless recliner much faster than you ever imagined. Of course there are some restrictions on this service and sadly, it is not available everywhere. It is no wonder that Stressless Vision Recliners are Exclusively Endorsed by the American Chiropractic Association. Come visit the Unwind Back & Body Store to experience the Ekornes Stressless Vision for yourself. If you have already decided and are ready to purchase, simply click the "Add To Cart" button below after selecting from the many available options. Please review our return policy prior to ordering or call 888-486-9463 for personal assistance. You may also email stressless@unwind.com anytime- 24 hours a day- 7 days a week. 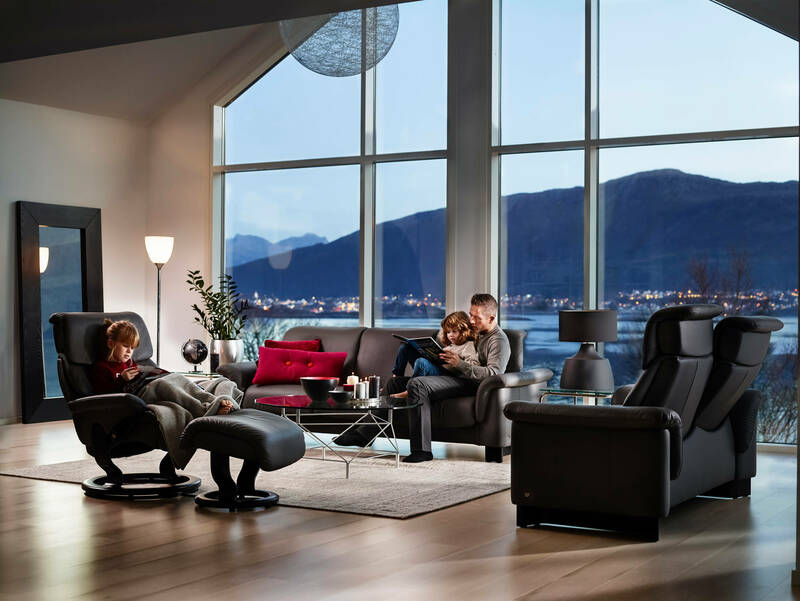 Have questions or need additional information about the small Ekornes Stressless Vision or other Ekornes Recliners or furniture? Please contact us at stressless@unwind.com or at 1-888-4-UNWIND (888-486-9463). We're here to assist you with your Stressless Vision Recliner or other Soothing Back Product or Furniture purchase.